Disclosure: Peace. Love. Paws. sent several items to Lapdog Creations, free of charge, for review purposes. We only share information that we feel is relevant to our readers, and all opinions expressed are our own. 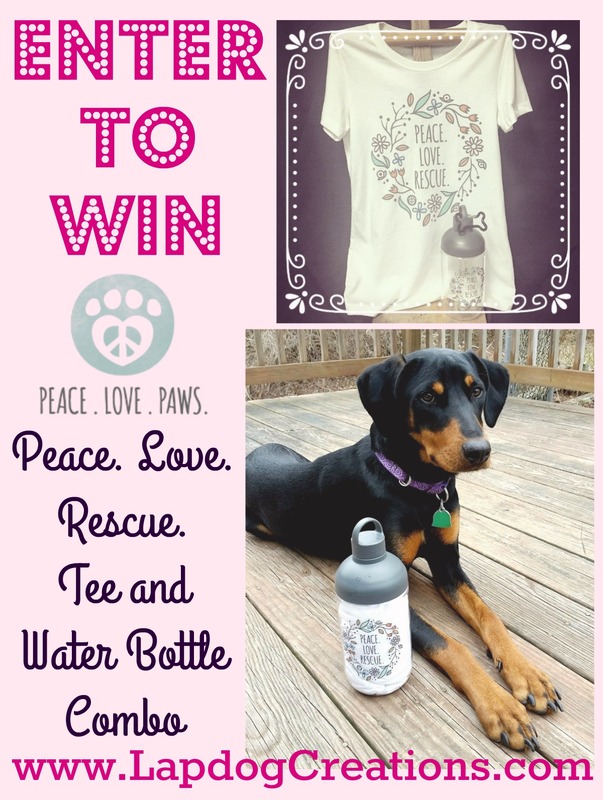 Peach Love Paws is responsible for the giveaway prize. Thanks to Peace. Love. Paws., proud Dog Moms and Dads can now show their love for all things dog in a modern, fashion-forward way! Based in Wisconsin, Peace. Love. Paws. was founder by a true animal lover. 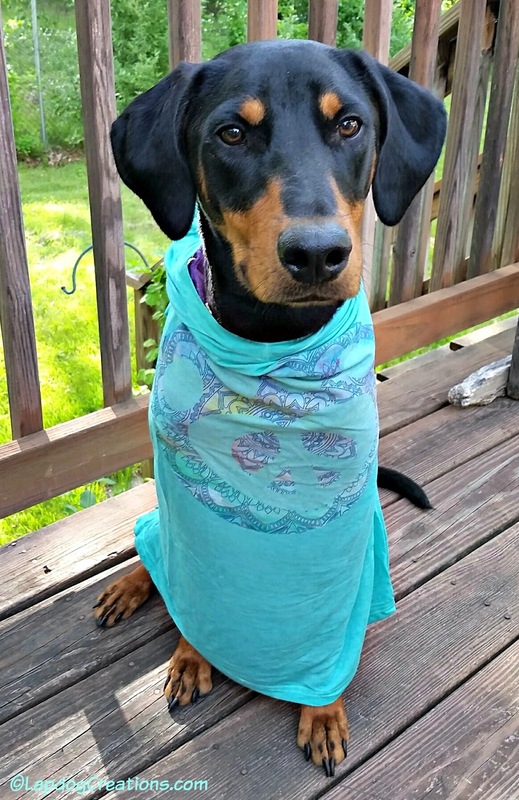 Alissa Gander, a Mom of four (2 human, 2 canine), recognized the need for high-quality and versatile apparel for pet lovers while operating an animal hospital and pet resort. 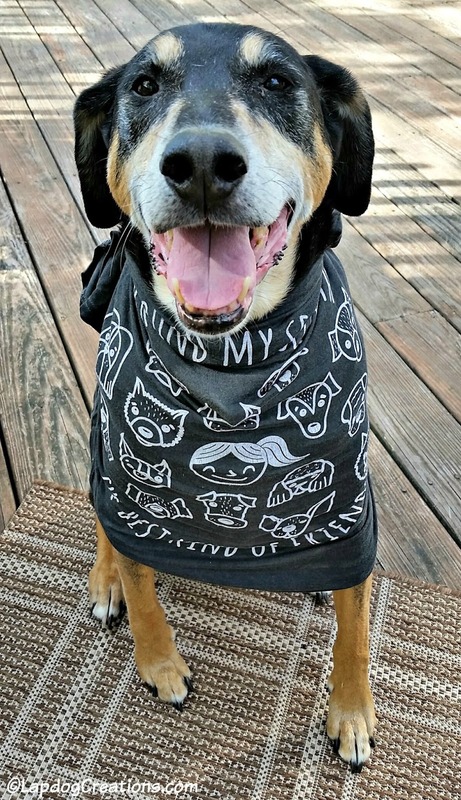 "I wanted to offer apparel that you could wear to the dog park or out to dinner," said Gander. And that, she did. The Peace. Love. Paws. 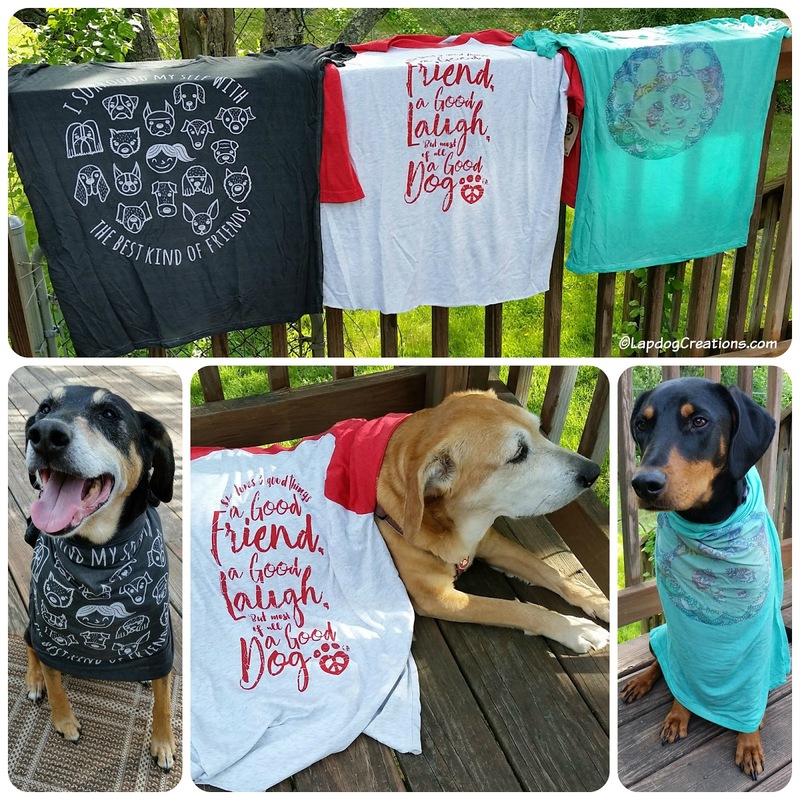 line features tees and hoodies, as well as scarves, jewelry, tote bags, magnets, notecards, mugs and more! I have been a huge fan of the company for some times. Not only does Alissa have an eye for stylish clothing and accessories, but she has made a commitment to give back. In addition to a portion of retail proceeds going to support the efforts of shelters throughout the United States, Peace. Love. Cause. was designed to help shelters raise funds. "The love and admiration for animals is a choice and lifestyle, and we choose to give back to those that can make the most difference." - Peace.Love.Paws. We received several items for review, all of which are beautifully designed. Teutul and Penny had fun modeling the tees, and certainly rocked them far better than I could. Sophie was caught lying down on the job, but still looking pretty chic. 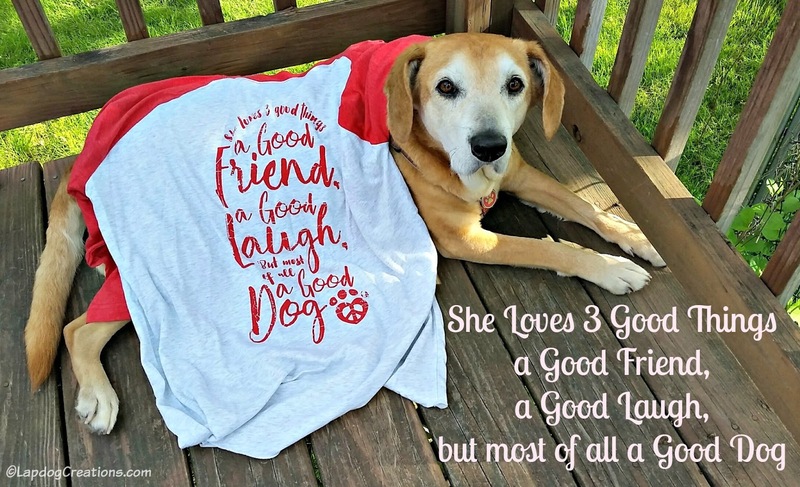 The "She Loves 3 Good Things" baseball shirt is perfect in so many ways. The baseball style shirt is a unisex fit, so it's a little larger in the sleeves and waist, which I think makes it a perfect "boyfriend style" shirt. Pair it with your favorite jeans and take your good dog for a walk today! I love the design so much that I'm hoping Peace. Love. Paws. will put it on a tote bag and hoodie too! A nice, heavy hoodie would make a perfect fall go-to for all your outdoor fun (hint, hint, hint). The "Surround Myself" tee is one of my most favorite designs. After all, I do surround myself with the best kind of friends - don't you? I literally laughed out loud after our photo shoot. Just look at that grin on Tut's face. Either he's going for the cuteness-overload award, or he somehow realized just how uber soft and comfortable this shirt is! The 95% rayon, 5% spandex jersey flowy tee is perfect for a weekend hike or a move date night. The teal-colored "Hippie Paw Print," is another uber soft, flowy tee that looks great with just about anything - shorts, a flowy skirt, or even as a beach cover-up. It's also available in coral. As mentioned above, Peace. Love. Paws. 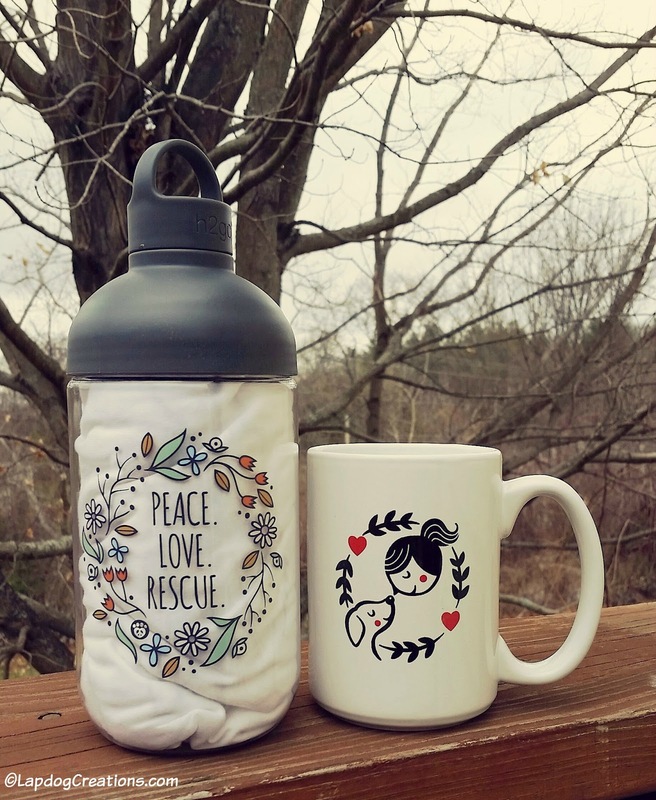 gives back to shelters and offers fundraising opportunities for rescue groups, so it's no wonder they have a beautiful Peace. Love. Rescue. design in their growing collection! Now we can show our support and love for rescue with a simple, yet elegant design. It's available on a ladies cut white tee, as well as a 34oz BPA-free water bottle. They are sold separately, but if you order the pawesome combo, you'll save $5! 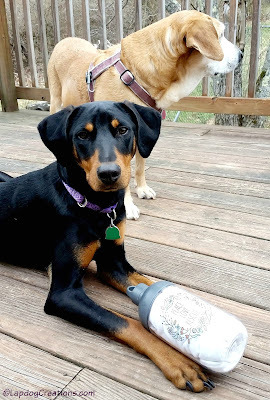 I love the bottle design, which allows you to twist-off the small cap for human consumption, or you can twist off the whole top which doubles as a drinking cup for your pup! Peace. Love. Paws. has several other great designs available on tees, as well as tote bags, mugs, notecards and more! The "True Love" design has been a favorite of mine since the line launched. Awhile back, we were sent the tote and mug - both of which have gotten much use! The 14oz mug truly is perfect for every dog Mom, but I do wish it was available in a larger size mug (yes, I'm one of those "extra large" mug people). In the meantime, I just drink a couple extra cups! So what do you think? Have you already started your Peace. Love. Paws. wish list? Are you ready to up your pet pride wardrobe game and save? Visit Peace. Love. Paws. and use our special coupon code lapdog20 to SAVE 20% off your entire order! We can't wait to hear what you get. Thanks to the folks at Peace. Love. Paw., one (1) lucky winner will receive a Peace. Love. Rescue. Tee and Water Bottle Combo. Everything is so cute, but I especially like the "TRUE LOVE CANVAS TOTE BAG"! I love them all, it's really hard t choose. Love the True Love and Surround Myself but I think maybe Dog Is Love is my favorite. But then there's the My Wish tote and all those charms and earrings. How's a girl to choose? I love both the coffee mugs at the end! You have some mighty cute models there. They make the tees look even better! I love the Love You Long Time dachshund tee, haha! The navy Peace Love Paws and the You Are One in 4 Million are cute, too. They have a lot of cute designs. The True Love one is adorable. 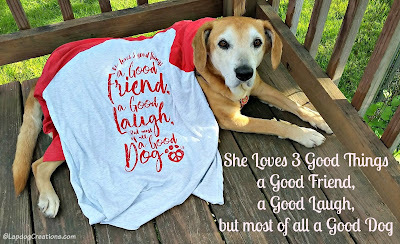 I'm a huge fan of baseball style tee shirts and I love the "she loves three good things" tee. I will enter and check out their site. Never enough dog themed clothes, right?!! Love. These are do lovely! I really like one & the pretty teal colored one with Paw print. I love Pet companies that give back to the community! I love these shirts! The designs are beautiful! Love the True Love design and the others. I would use the coffee cup and t-shirts. 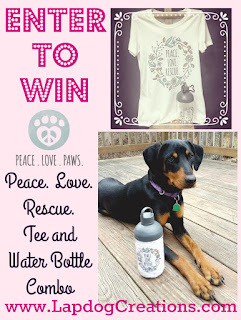 I love the peace love paws hoodie and and also the peace, love rescue shirt. But I actually love them all. I think the hippie paw design is my favorite because of the colors. What wonderful items! 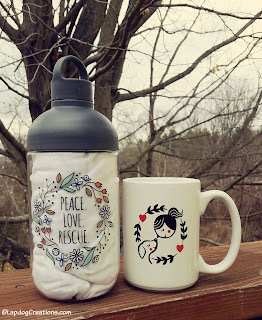 Love the My Wish for All Animals tote and mug! Thanks for hosting the great giveaway! They must be totally irresistible!! I'm definitely a coffee tee girl!! I would love the Peace Love Paws hoodie. I know the gal who founded this company - she won a Women in the Pet Industry award the year I won one, too. SO pawsome! I like the true love dolman tee, I also like the bag but it's sold out. There are so many great options! I think the most practical choice for me is the true love mug, but honestly, I want a lot of the items. Beautiful designs. Thanks for introducing me to this company! These are cute tees! Thanks for the opportunity to win. Cute cute cute!! I am a sucker for cute animal themed apparel and accessories. Cute cute cute! I'm a sucker for cute animale themed apparel and accessories. Love love the baseball tshirt. This site is going on my christmas list. Yes i mean the site...as in everything i want! My favorite is the Peace.Love.Paws. purple hoodie! i love the t shirts especially the "surround myself" one. i would love this, since my very best friends are my 3 gals. I absoultly love these shirts and could always use another one. Paws crossed! I love the MY WISH TOTE and the PEACE. LOVE. PAWS. SIGNATURE LOGO CHARM. So much nice stuff! I loved the unisex hoodies - they had two different ones that I just can't decide between! this shop has lots of cute stuff. but I really like the scarves. I love the PEACE. LOVE. PAWS. SIGNATURE UNISEX PURPLE HOODie. I like the surround myself shirt! I like the bags, especially the I Wish tote.